With a heavy workload, wedding planning and home renovations on the go, it’s been getting increasingly difficult to find the time to research recipes and shop for groceries. This is where Ontario-based Chef’s Plate (@ChefsPlateCA) steps in. Featuring 6 new recipes each week, you can choose which recipes you want and they’ll deliver the required pre-portioned ingredients right to your door at the beginning of the week. If you’re not there to accept the delivery, there’s no need to worry about the food going bad – the ingredients arrive in an insulated box with reusable ice packs. 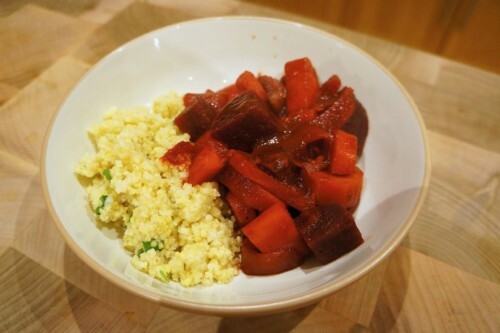 The ingredients will also last up to 4-5 days in your fridge, so you don’t need to prepare the meals immediately. Last week, I had the opportunity to try a two-person two-meal plan and was pleased with my experience. From the get-go, the experience was quite seamless. You choose the recipes and meal plans online and the recipe details on the website provides you with everything you need to know including a description of the recipe, the difficulty level, the estimated prep time, calories per serving and a list of exactly what they’ll send in the box. On Monday, I came home to a small box left in front of my door (you’ll receive your delivery by 6pm on your delivery date). If you live in a condo, you can leave specific instructions to have the delivery left with your concierge. When I opened the box, I found two separate Ziploc bags with ingredients – one bag per recipe. I have to admit, when I first took the ingredients out of the box, it didn’t seem like very much food. I honestly didn’t think it would be enough to feed two people but I was proven wrong. Once everything gets cut up and cooked, it results in the perfect amount of food! I loved that all the ingredients were clearly labelled and that they provide you with the exact amount of ingredients required for each recipe. It saves a lot of time when you don’t need to portion everything out. 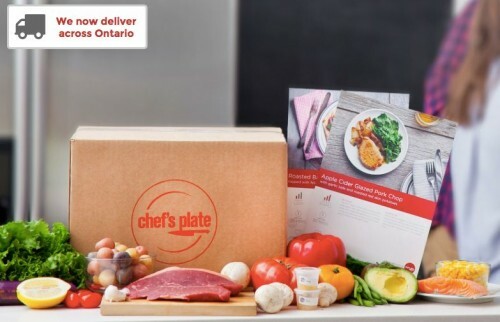 Chef’s Plate prides themselves on providing delicious, nutritious and easy-to-prepare recipes. They state that all their recipes can be prepared in 30 minutes or less. The two recipes we tried proved to be the case. The step-by-step recipes were pretty fool-proof and quick to make – an absolute necessity on a weekday. The recipe cards included in the boxes also contain cooking tips and a list of “What You Need at Home” like parchment paper, knife/cutting board, large pot, etc. One important thing to note is that you’ll need to have salt, pepper and oil on hand as these ingredients are not included in the box. When I’m not sure what to prepare for dinner, I can easily spend an hour looking up recipes online so it was nice to have six great options laid out in front of me to choose from. The six recipes change each week so it definitely won’t get boring. 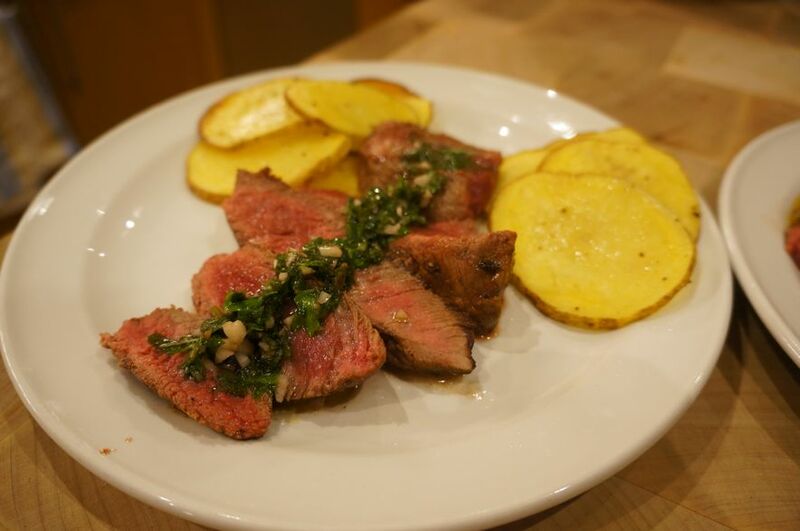 The two recipes we tried last week were the Steak and Garlic Herb Sauce – with crispy potato cakes and pear salad and Beet Bourguignon – with baby bella mushrooms and herbed millet. I was impressed with the quality of the ingredients. Chef’s Plate works closely with family-run farms and purveyors to provide customers with the freshest ingredients and the locally sourced meats are raised without the use of antibiotics. We were quite impressed with the quality of our steak (and thankfully, Mike cooked it to perfection!). The steak recipe with the crispy potato cakes was a real winner. We really enjoyed the garlic herb sauce and crispy potato cakes – we’ll definitely be adding these into our regular rotation. We’re big meat eaters but we thought we’d try something different and pick the Beet Bourguignon – with baby bella mushrooms and herbed millet, a vegetarian take on beef bourguignon. I wasn’t sure what to expect but it was really delicious and surprisingly filling! Unfortunately, there are no single meal plans. 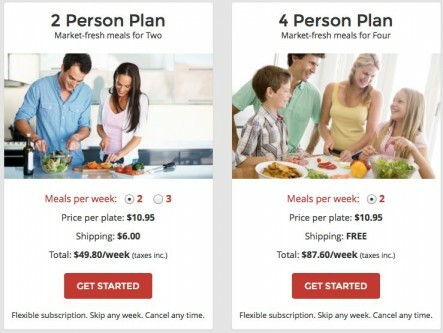 However, if you live on your own, you could order the two-person/two-meal plan and have dinners (or leftovers for lunch) for four days. Saves Time – no more researching recipes, spending time searching for ingredients at the grocery store or portioning out ingredients for each recipe. The pre-portioned ingredients are delivered right to your door! No Waste – How many times have you purchased an ingredient, only to use a pinch of it with the remainder of it going bad in your fridge? Chef’s Plate provides you with the exact amount of each ingredient required in each recipe. Quick and Easy-to-follow Recipes – Chef’s Plate promises that the recipes can all be prepared within 30 minutes and from our experience, the promise proved to be true! 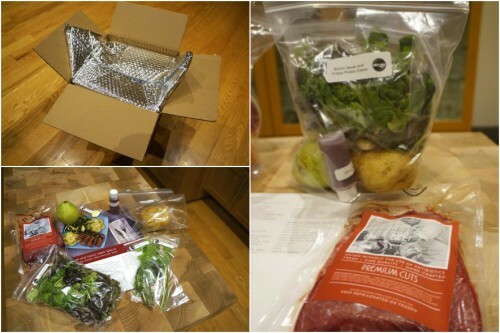 The recipe cards were clearly laid out with step-by-step instructions and were incredibly easy to follow. For those of you who are more advanced home cooks, just look for recipes that have a higher difficulty rating. New Recipes – Each week features six new recipes to choose from so you’ll never get bored eating the same thing every week. 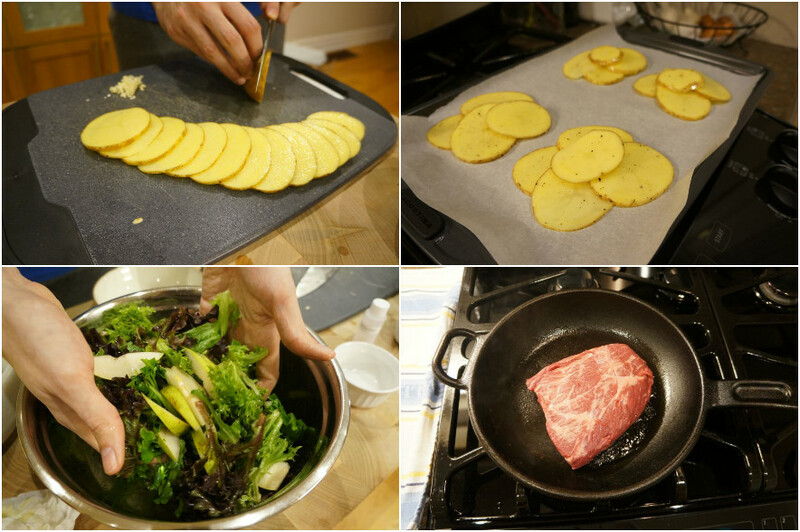 It also gives you the opportunity to work with ingredients you’d otherwise not experiment with at home. As much as we love beets, we had never previously purchased it to cook with since we were always afraid of the stains it would leave everywhere. The Chef’s Plate recipe card provided a handy tip – to use parchment paper on the cutting board and it worked like a charm. I’ll definitely be buying more beets to use at home! Flexibility – I love that this service doesn’t require any commitments for their weekly subscription. You can skip any week, pause or cancel at any time. Interested? Sign up here to receive 2 free plates off your first order!